Your operation cannot be complete without an effective means of loading or stockpiling split firewood and other materials into a truck or trailer. Quickly move your splitwood at the steady rate of 80 feet per minute. 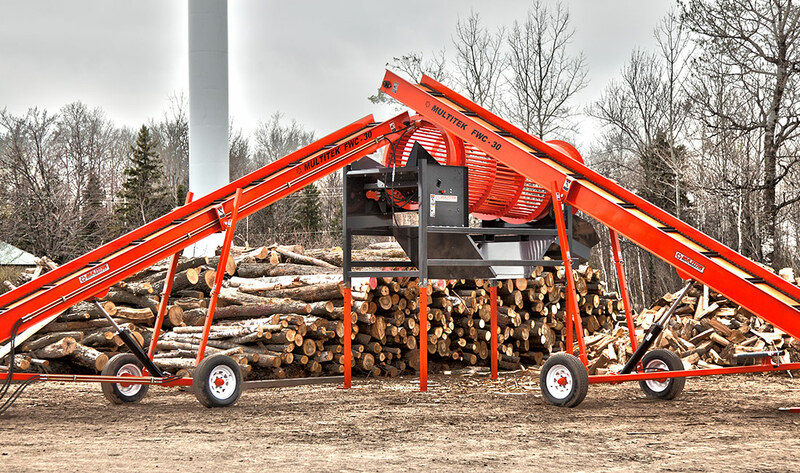 Multitek offers two rugged, mobile firewood stacking discharge conveyors Model FWC-20 in 20’ (6.06 m) length FWC-30 in a 30’ (9.09 m) length and 30” (76 cm) widths, standard features are a tubular steel under carriage, lightweight channel sides and operator controlled hydraulic lift and operation. This includes hydraulic drive which can be quick connected to an auxiliary hydraulic power source. Additional options available are self-contained gas engine power unit packages.